For anyone with a sweet tooth, the words “Cookie Butter” sound like a dream come true. The American cult snack/dessert recently made its way to Canada and can be found anywhere President’s Choice products are sold. “Cookie Butter” may sound enticing, but the sugary spread is made from unhealthy stabilizers and thickeners. We have created a superfood-filled vegan and gluten free recipe that is a healthier treat for the days when you feel like cheating (but not really). The lightly spiced flavour and smooth texture of Cookie Butter quickly draw you in, but what exactly are you eating? Cookie Butter is made from finely ground Ginger Snap that are emulsified with various vegetable oils and stabilizers. With a list of ‘ingredients’ that you can barely pronounce, it is not a food that we would recommend for a CleanDiet. We enlisted the help of Deanna Dickins – Food, Beauty and Travel Blogger, and Co-Founder of Better than Yia Yia’s Mediterranean Catering in Toronto – to help us create a mouth-watering, healthy and equally magical version of Cookie Butter. Balance is key to a healthy lifestyle, as well as to a good diet. Part of maintaining that balance is never feeling like you are depriving yourself of snacks and treats. To create the perfect healthy Cookie Butter, it needed to have a rich, satisfying texture, and bold, spicy flavours. Coconut Oil is such a versatile ingredient – You can use it for making flaky vegan pie crusts or as an intense moisturizer/cleanser/tooth whitener in beauty applications. When kept below 24 degrees Celsius, it has the perfect buttery consistency. We use the same spices in our Better than Yia Yia’s Gingerbread cookies, which is the perfect flavour profile for traditional Cookie Butter. We added turmeric for an extra health kick and black pepper to help absorption in the body. Toasting the spices in oil for a few minutes helps them release their essential oils, bringing out deeper flavours, and removing any chalkiness that sometimes happens with ground spices. Pink Himalayan Sea Salt was chosen for its extra minerals, but table salt or fine sea salt can also be used. Since this is a dessert, we have to have some sugar. We chose richly flavoured sweeteners like brown sugar, molasses and pure maple syrup, because a little goes a long way. Maple syrup also has a low GI, which means that it does not spike your blood sugar, leading to fat storage; The calories you consume are more quickly expended as energy. Molasses also help with the classic gingersnap cookie flavour, and help with the smooth, thick consistency of the final product. To preserve the healthy oils in the cooked spices and to keep your Superfood Cookie Butter fresh, keep it in the refrigerator up to four weeks. Remove it about 15 minutes before digging in. 1. Warm your spices in 3 tbsp Coconut Oil over low heat for 1 – 2 minutes. You want to warm the spices to bring out their oils to give your Cookie Butter more flavour. I also find that cooking spices like turmeric and cinnamon soften their flavours, giving them more sweetness and less of a chalky taste. 2. Add your sweeteners. Continue warming the mixture over low heat until the sugar has dissolved and the molasses are combined. 3. Turn off the heat and let cool for 20 minutes. 4. Add room temperature spice mixture to 1/2 cup Coconut Oil. 5. Stir to Combine. Refrigerate 10 to 15 minutes until the mix starts to solidify. 6. Remove from the refrigerator and shake to redistribute spices and molasses. Chill for another 15 minutes, or until it reaches a ‘Peanut Butter like’ consistency. 7. 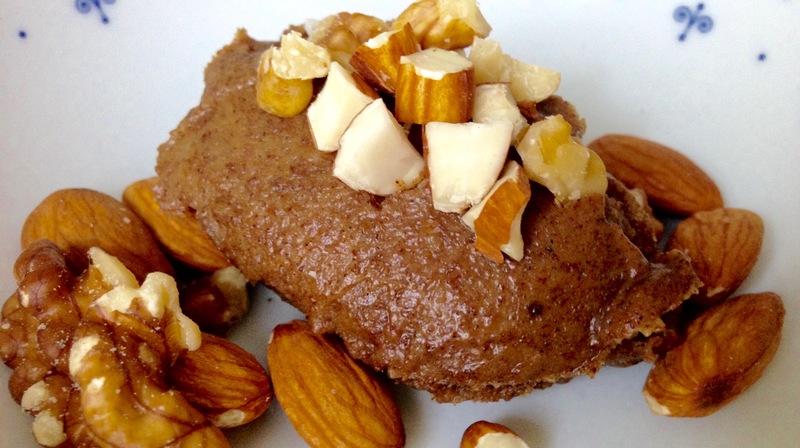 Stir your Cooled Cookie Butter and Enjoy!